The historic zones of China Camp State Park are vulnerable to any potential rise in sea level created by Global Climate Change. Cultural Resources throughout the California State Parks system are being threatened from the effects of the climate change that is already underway. Acquired by the State in 1977, China Camp State Park is one of the least disturbed natural watersheds remaining along the shores of San Pablo Bay. China Camp State Park is located on the southwest shore of San Pablo Bay, three miles from downtown San Rafael in Marin County. China Camp has a natural watershed along the shores of San Francisco Bay. Features include meadow and oak habitats that are home to a variety of wildlife, including deer, squirrels and numerous birds, as well as extensive inter-tidal marshes. 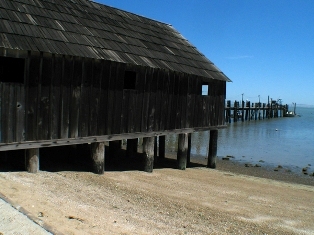 Historical significance of the prehistory and history of China Camp is an important dimension to the park. What is now called Point San Pedro was originally part of Coast Miwok territory. The Coast Miwok made baskets and clamshell disk beads, and traded them for such locally unobtainable resources as high-grade obsidian from Lake County tribes. Their China Camp village site probably consisted of ten or twelve households, with eight to ten individuals living in each. The remains of numerous archaeological sites have been found in the park. Houses were built of grass and tule thatching over a dome framework of small poles. A Chinese shrimp-fishing village thrived on this site in the 1880s. Nearly 500 people, originally from Canton, China, lived in the village. In its heyday, there were three general stores, a marine supply store and a barber shop. The Chinese, like many other immigrant groups, came to California with the prospect of mining. There were three general stores, a marine supply store and a barbershop. Currently the Chinese fishing village consists of the remains of a few buildings along the water's edge, with only fragments of foundations. Several historic structures have been preserved, and an informative museum exhibit makes it easy for visitors to imagine a way of life that has been generally forgotten in California history. The settlers were fisherman by trade in their native country. Over 90% of the shrimp they netted were dried and shipped to China or Chinese communities throughout the United States. Since several of the historic structures have been preserved, their location along the water's edge is leading cultural preservationists, archaeologists, and historians to begin a re-evaluation of historic building planning policy guidance. Should California State Parks change historic building rules to allow for climate change? Cultural resource professionals agree that we shouldn't alter appearance of historic structure like the China Camp buildings, but traditional materials can be re-used with changes to capacity or design. Making sympathetic changes to historic buildings is ultimately the lesser of two evils. Without improved resilience, the fabric, and sometimes the priceless contents, could be seriously compromised. New flood defenses, particularly in historic towns, which can cause major archaeological damage along historic waterfronts and may impair the character of historic waterside buildings. Additionally, the design integrity of some historic buildings and landscapes could be damaged by the need to provide new and more effective preservation, up to and including relocation of the buildings to higher ground.